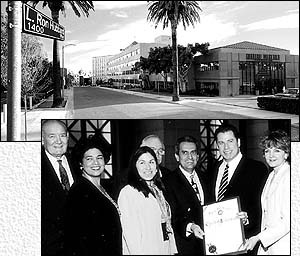 L. Ron Hubbard Way: Completed in 1997, L. Ron Hubbard Way, a Los Angeles street where several Churches of Scientology are located, is the result of a shoulder-to-shoulder effort by City officials and employees, local residents and members of the Church of Scientology. Official resolutions were awarded to the major contributors to the successful completion of the project. Above, City official John Ferraro acknowledged L. Ron Hubbard and the Church of Scientology with a certificate, accepted by actor John Travolta. hroughout this guide, an emphasis has been placed on the tools that empower the volunteers of our communities to be truly of service to their communities. Armed with the tools described in each chapter, they are able to make a difference  rapidly, effectively and permanently. It is one thing to mentor a young person or to be a good role model. It is quite another to apply skills that visibly improve literacy, mend relationships that appear to be irrevocably torn, bring order and relief to locales struck with disaster, or help in a myriad of other ways to enhance an individuals chances of survival in the present and into the future. It is this ability to create substantive and meaningful change that those volunteers skilled in L. Ron Hubbards social betterment and improvement methods bring to the arena of volunteerism. And for every contribution they make, they take with them a sense of personal accomplishment and pride. We recognize that while individuals form the backbone of community service, individuals with similar goals working together can be far more effective. The well-organized endeavor of 10 volunteers can get done the work of twice as many  or more  individual efforts. Although Mr. Hubbard provided the means to help people on an individual basis, he also developed highly workable methods  a technology  for organization and administration, and even for increasing individual work performance. Originally applied as a means for orderly but rapid and remarkable growth for organizations and groups, Mr. Hubbards administrative technology has become vast in its application to virtually any effort.